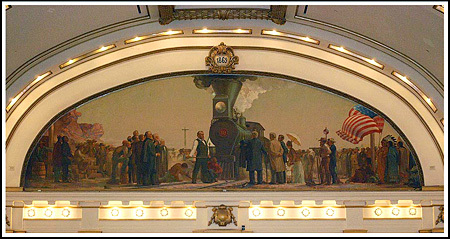 Craig Harmon launched a new web page today to commemorate the 100th anniversary of murals inside the restored Union Pacific Depot in Salt Lake City. The city, on pioneer trails and the Transcontinental Railroad, also hosted the Lincoln Highway. The station, originally just called the Oregon Short Line Depot, is at Third West and South Temple streets. Artists John McQuarrie & August C. Wocker were commissioned in September 1909 and by December the murals were finished. McQuarrie also made the bronze for the Betsy Ross Memorial Flag Pole at the Lincoln Highway’s western terminus. This entry was posted on December 17, 2009 at 11:58 pm and is filed under highways, history, Lincoln Highway, museum, transportation, travel. You can follow any responses to this entry through the RSS 2.0 feed. You can leave a response, or trackback from your own site. Thank You showing this. I really enjoy seeing it. And I’ve updated my page.